SPEC MIX Pre-blended Stucco products are available in fiber added base one-coat, a scratch and brown coat, or in a custom-colored finish coats stucco. 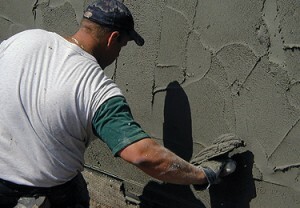 All of our Stucco products are formulated for optimum workability and reduced shrinkage. Preblended SPEC MIX® stucco contains Portland cement, lime , sand and propriety additives to ensure workabilty and durability for your next stucco project. As a licensed SPEC MIX® manufacturer, PACKAGE PAVEMENT blends clean, quality aggregates, cementitious materials, stable pigments and fibers that meet all applicable ASTM and UBC standards. These products provide the strength you require and the long-term durability the project owner expects. Delivered in our sturdy 3,000-pound bulk bags or easy to handle 80-pound bags in either 42 or 30 pack short pallets, all you need to do is start your mixer and add water. Getting quality, consistent stucco is just that easy! SPEC MIX® stucco products are lab tested and/or field tested for superior workability and reduced sagging for faster installation, optimal compressive strength, flexural strength and reduced shrinkage for long-term durability. Each mix is a custom blend of cementitious materials, additives, aggregates and fibers, when specified, which undergo rigorous quality control and product testing. Our stucco products can be used in traditional three-coat systems or two-coat systems and as a colored finished coat. Our preblended, cement based products meet ASTM C 926 standards. Our SPEC MIX ONE COAT FIBER REINFORCED STUCCO’s are available in 42 bags per pallet or our 30 bag mini pallets. We also offer a wide variety of colors form white to black and every color in between. Call us today at: (800) 724-8193 to speak with a sales representative and learn more about SPEC MIX Stucco Products.